THROUGHOUT the war a distinction was made between individual training, on the one hand, and crew and unit training on the other. The former prepared students in their individual specialties, such as pilot, navigator, or gunner; the latter taught those individuals to work effectively as a team. 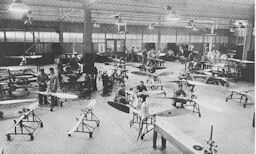 After July 1940 individual training of flying personnel was chiefly the function of the three Air Corps training centers, operating under the direction of the Office of the Chief of the Air Corps. In February 1942 this function was delegated to a single Flying Training Command, which, it will be recalled, in 1943 was merged with the Technical Training Command to form the Training Command, with headquarters at Fort Worth, Texas. 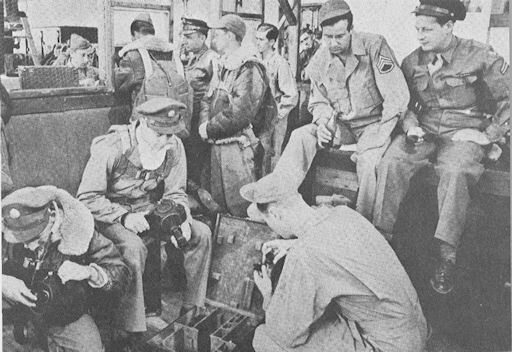 Combat crew and unit training was conducted from early in 1941 by the four continental air forces; training of cargo and ferrying crews was carried on by the Air Transport Command. In February 1941 the War Department authorized establishment of three Air Corps replacement training centers for classification and preflight instruction of candidates for pilot, bombardier, and navigator training. The official designation of "preflight school" was authorized on 30 April 1942, and the term replacement training center was dropped. By that time preflight schools were in operation at Maxwell Field, Alabama; Kelly and Ellington Fields, Texas; and Santa Ana Army Air Base, California. The school at Kelly Field was soon afterwards moved to an adjoining site, designated the San Antonio Aviation Cadet Center. Of the 175 hours of instruction called for in the official academic program of 1944, 110 were allotted to basic military and officer training. One-half of this time was set aside for close order drill, ceremonies, and inspections; the remainder went to classroom or squadron instruction in customs and courtesies of the service, chemical warfare defense, small-arms familiarization, and related military subjects. The West Point code of cadet discipline and honor was regarded as the model for the preflight schools. The traditional class system, with its more or less stereotyped forms of hazing, was introduced at first, but this practice came under severe public attack, and in spite of its defense by the responsible military authorities, the class system was abolished by order of the Flying Training Command in May 1943.9 While there may have been disciplinary advantages in the supervision of each lower class by upperclassmen, the hazing associated with the system interfered with the primary mission of the schools and was ill suited to the temperament of the civilian soldier. The preflight schools formed an integral part of aircrew training throughout the war. In 1943 an additional phase of pre-flying instruction was introduced: the aircrew college training program, which lasted until July 199.4. The college program, to put it bluntly, came into existence not so much to meet an educational need as to hold a backlog of aircrew candidates. As has been previously noted,* the AAF had found it advisable in 1942 to recruit aviation cadets in excess of its immediate needs and to hold them in an inactive enlisted reserve until needed. By December 1942 approximately 93,000 men were awaiting classification and instruction, and many of them had been in this limbo for six or seven months. Not only did this extended in-active period discourage some of the men, but the pool of idle man-power received increasing notice from selective service boards and the War Manpower Commission. Accordingly, General Arnold proposed to the War Department that these men be called to active duty and given a period of college training designed to make up educational deficiencies. * See above, pp. 494-97. Higher headquarters provided little guidance in the development of an instructional program for on-the-line students. The Training Command advised only that "trainees will be given duty assignments with aircraft maintenance and servicing where they will get more practical training for their future instruction." Responsibility for implementing the program was left almost entirely to individual station commanders, and this fact resulted in considerable variation in the training. Some commanders reasoned that the students would shortly be returned to the normal sequence of aircrew instruction and gave them slight attention; others saw the possibility of a longer period of delay and devoted a great deal of consideration to their training, work, and recreation. Although the importance of other specialties was increasingly recognized during the war, the pilot remained the principal object of Air Corps training. While each member of the aircrew was essential to performance of assigned missions, the general success and safety of the crew depended mainly upon the pilot, who was the aircraft commander. Although the AAF made a substantially successful effort to give all flying personnel due recognition, it properly put flying training in top priority. The three stages--primary, basic, and advanced--were common to the training of all Air Corps pilots, and upon graduation from advanced, students received their wings and bars. This step, however, did not signify the end of their training; the new pilots were given additional periods of specialized instruction suited to their military assignments. Such instruction included in all cases a period of transition flying. The term "transition" was applied generally to a pilot's learning to operate an unfamiliar plane; thus all students underwent several brief transition phases as they progressed through the normal stages of pilot training. In primary they learned to fly a small aircraft of low horsepower; in basic they transitioned to a heavier plane with more complex controls; in advanced they learned to fly a still more powerful machine which approximated the characteristics of combat aircraft. Transition to combat planes, which generally did not occur until after a pilot had earned his wings, was a larger undertaking than previous transitions to training planes. It involved not only learning to fly a complex, high-performance aircraft, but also the acquisition of flying techniques, preliminary to operational unit training. In order to make adequate provision for this step, a special stage, called transition, was evolved in the major pilot programs. * See above, pp. 456-61.
was the selection of students for single- or two-engine advanced training. Assignment was based upon a combination of factors--current requirements for fighter and multiengine pilots, the student's aptitude, his physical measurements, and preference. After the middle of 1944, however, student choice was generally disregarded. Preferences for fighter training exceeded the demand, and there were not enough men with the requisite physical qualifications who desired bombardment. Some schools found it necessary to assign all men with the required physique to advanced two-engine schools. The differentiation of single-engine from two-engine training in the advanced stage was not effected until the spring of 1942 although planning for the change dated back to October 1940.34 As it had evolved by 1944, the single-engine curriculum consisted of seventy hours of flying instruction, compared with seventy-five hours in 1939. It included five phases--transition, instrument, navigation, formation, and acrobatics; Link trainer time was also required. Instrument operation was a continuation of the methods learned in basic; the transition, navigation, and formation phases all required night flights. In response to the lessons of war, increasing emphasis was placed on formation flying, especially at high altitudes and using the close, three-plane V-formation. Acrobatics included all conventional combat maneuvers within the performance limits of the advanced trainer.35 Although some of the graduates of the advanced single-engine school eventually were assigned as noncombat pilots or were sent to bombardment operational training units for service as co-pilots, the principal mission of the school was to prepare students for subsequent flying in fighter aircraft. To achieve this end, the advanced schools stressed the handling of maneuverable, speedy training planes and the development of instantaneous control reactions in students. FORMATION FLIGHT, FOSTER FIELD, TEX. ALERT NET PROBLEM AT FOSTER FIELD, TEX. 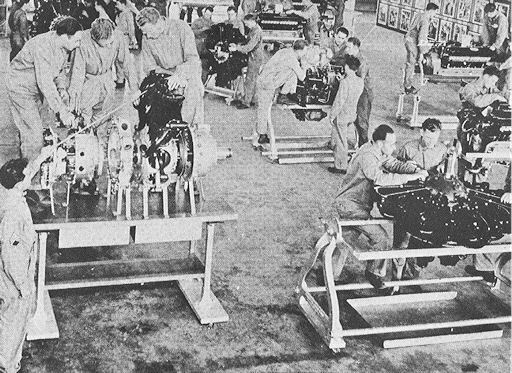 ENGINE MECHANIC CLASS, RANDOLPH FIELD, TEX. When the accelerated training program was begun in 1939, the ground curricula at the various stages of instruction consisted of a large number of short courses. For several years thereafter, directives from the higher commands remained vague as to requirements, and each school consequently had a more or less individual curriculum. Continuity of subject matter from one stage to the next was lacking, and considerable duplication between stages prevailed. Gradually, a more orderly sequence of ground training was developed,41 and by May 1944 the program had become relatively well stabilized at each stage of individual training. Five major courses, calling for a total of ninety-six hours, were given at the primary schools. Almost half of this time was devoted to the aero-equipment course, which was devoted to the principles and workings of the various operating systems of an aircraft. 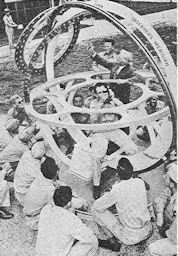 Navigation, the next most extensive course, was a continuation of the maps and charts course taught in the preflight schools and emphasized planning for cross-country flights. 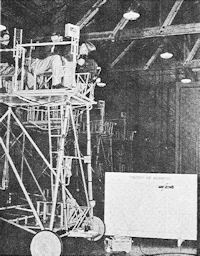 A course in principles of flight consisted of elementary applied physics, with special reference to airplane structures and flight behavior. Continuation training in aircraft and naval recognition, as well as in radio code, was also provided. In all courses theory was held to a minimum, emphasis being upon teaching the student how to perform necessary operations. Pilot trainees received their first instruction in weather during the basic stage. They were also then introduced to the principles of instrument flight, because it was in the basic schools that students learned to fly at night and under all weather conditions. Radio communication procedures were taught at this stage, and the sequence of training in aircraft and naval recognition aimed at achieving proficiency in identifying relatively distant views of the principal planes and vessels. in weather, taking up the subject where it was left at the end of the basic stage. Further ground training on flight instruments was also given to both types of students, as well as a course in flight planning. The chief difference in the two curricula was in the aeroequipment course, which, since the two-engine was more complex than the single-engine trainer, was given more time at the two-engine schools. 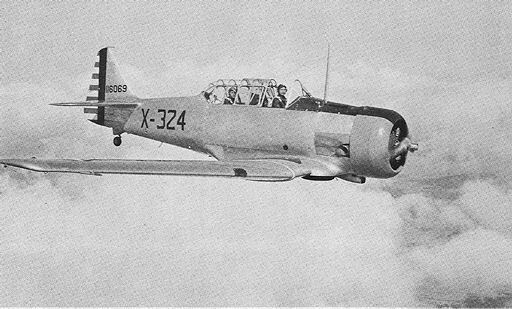 Single-engine students, on the other hand, received training in armament and fixed gunnery, which was not required for two-engine pilots. The method of teaching men to fly military aircraft remained fundamentally the same from 1939 through 1945. The sequence was this: explanation by the instructor of each new maneuver, actual demonstration by the instructor, supervised student performance, correction of student errors, and then practice. 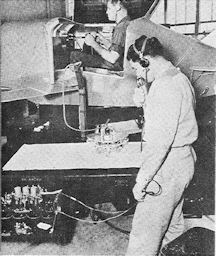 Progress checks by supervisors were made at specified intervals; final checks, toward the end of each stage of training, tested the ability of the student to operate the airplane under all required conditions. The student, so far as practicable, was taught by the same instructor through all the lessons of a particular training stage. Departure from this "all-through"
The principal item of equipment in pilot training was, of course, the airplane itself. Almost all of the schools were hard pressed by the shortage of trainers until after 1943, and it was necessary to use some models which were hardly satisfactory but, being the only ones available, had to be used. Full conversion to the most appropriate models was not accomplished until the spring of 1945.48 Among primary training planes, the Stearman PT-13 was eventually selected to replace all other primary trainers. A biplane, and thus different from later trainers and combat types, the PT-13 had the special virtue of ruggedness, a quality not to be despised in a plane that had to take the punishment inflicted by a novice.49 During most of the war period, the Vultee BT-13, a low-wing monoplane of medium horsepower, served as the standard trainer for basic flying. Regarded by many as altogether too easy to fly, it was being replaced during the latter part of the war by the AT-6, a low-wing monoplane already in use as the standard trainer for advanced single-engine instruction.50 No suitable training plane became available for advanced two-engine flying until late in the war, when the B-25 was modified for the purpose. 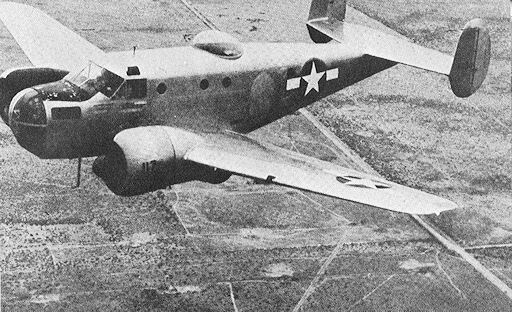 Theretofore, the Cessna AT-17 and UC-78, the Beech AT-10, and the Curtiss AT-9 were used, with the last considered the most satisfactory.51 In the transition stage, combat models, which could not always be the latest, were usually stripped down and flown without full fighting equipment. While the Air Corps had a splendid heritage of experience to build upon in the wartime training of pilots, it had no such advantage in developing instruction for bombardiers. Before 1940 the training of bombardiers was limited to on-the-job instruction in operational bombardment groups, both in the United States and at overseas bases. 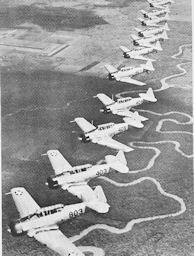 A small number of the trainees were pilots, but the majority were nonpilot enlisted men. 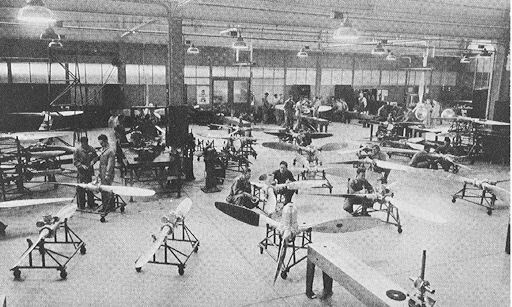 Plans had been under way as early as 1939 for the establishment of a specialized school for individual bombardier training, and a course for instructors was established at Lowry Field, Colorado, in July 1940. 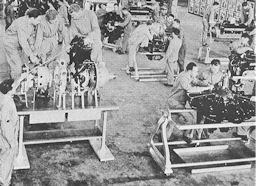 It was not, however, until late in 1941 that training of students in specialized bombardier schools began. At first the effort was made to conduct this training at fields where advanced pilot training was being given, but by the end of 1942 it was generally agreed that it was more satisfactory to conduct only one kind of training at one station. Specialized schools were established as rapidly as facilities would permit, and they expanded to meet the rising flow of students during 1942 and 1943. 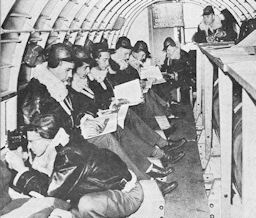 The students, who had received air-crew preflight training before entering these bombardier schools, were given a twelve-week course until the middle of 1943; as soon as combat requirements for bombardiers declined, the course was lengthened to eighteen weeks. By 1945 it was possible to provide twenty-four weeks of advanced individual training. bombardier's training. At least seven record missions, four by day and three by night, were required; in order to qualify for the combat stage, the student's average circular error for these missions could not exceed 230 feet (when converted to an altitude of 12,000 feet). 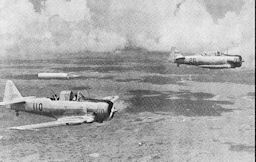 Bombing runs during the qualification phase were generally from two to three minutes in duration. * For this term, see below, p. 590. Every member of the combat crew had a vital responsibility in executing the aircraft's mission. When a bomber was under attack by hostile fighters, it was the aerial gunner who defended the lives of his teammates; on the skill he had developed rested the fate of the crew. * All except the career gunners received training in radio, armament, maintenance, or some other specialty in the AAF technical schools. Since this training was identical with that given to the corresponding ground technicians, it need not be described here. A discussion of training in the technical specialties is presented below, pp. 629 ff. deflection shooting, but they were generally too complicated. The use of tracer ammunition as a partial substitute for ordinary sighting methods was tried out experimentally. It was discovered, however, that observation of tracer trails often gave an erroneous impression of the true course of the bullets, and the tracer method did not gain wide acceptance. In October 1943 the schools adopted the position firing sighting system, a method adapted from but considered more accurate than the British zone system. Basically, the system involved aiming behind the attacker, instead of in front of him, as was true in deflection shooting, in order to compensate for the effect on the bullets of a bomber's own forward motion. In 1944 automatic compensating and computing sights were replacing the old iron ring and the newer optical ring sights. 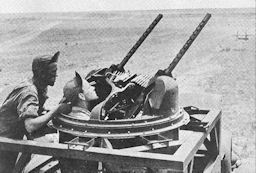 The automatic devices mechanically calculated proper allowances and made it necessary for the gunner merely to keep the enemy plane in his gunsight. The compensating sight was the one most generally used during 1945. 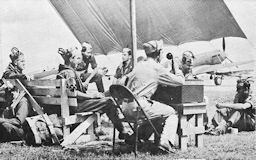 Almost all of the instruction at gunnery schools was performed by enlisted men retained for the purpose from each class of new graduates. The selection was at first more or less arbitrary, but later the desires and ability of the men were considered. The greatest single problem affecting the instructors' morale was their low rank; during 1942 the majority were privates or corporals. In the following years most instructors reached the grade of sergeant, but the problem of insufficient rank persisted throughout the war. There were two basic systems of instruction in flexible gunnery, the flight and specialist methods. In the former, one teacher took charge of a small flight of students and carried it through all phases of the course. In the specialist system the instructors concentrated on a specific subject, and students had a different instructor for each course. Practice varied at the several schools, although the Training Command in 1943 directed uniform acceptance of the specialist system. 1944 the program consisted of a large number of courses for radar mechanics and ground officers, described in the chapter on ground technicians and service personnel,* and several courses for flying radar observers. The most important of the flying specialists was the "radar observer-bombardment," who was trained to direct bombing through overcast (BTO). Three other types of radar observers were also trained for sea search, night fighter operations, and radar countermeasures. * See below, pp. 639-41. 1. Maj. Gen. B. K. Yount, "Building the AAF: Part 1 , Pre-flight Toughens 'Em," Aviation (Aug. 1943), p. 124, in AHS-48, Preflight Training in the Army Air Forces, 1939-1944, p. 1. 2. TC Memos 35-17, 14 Apr. 1944; 50-23-1, 23 May 1944; and 50-27-1, 12 May 1944. 3. Ltrs., OCAC to CO SETC, 1 and 2 Oct. 1940. 4. FTC Memos 50-1-1, 21 Apr. 1943; 50-23-1, 19 Feb. 1943. 5. TC Memo 50-23-1, 23 May 1944. 6. Hist. SAAAB, 7 Dec. 1941-31 Dec. 1942; Hist. SAACC, May-June 1944, p. 18. 7. Memo for Maj. Gen. B. K. Yount from Co1. K. P. McNaughton, 16 Nov. 1942; Hist. EFTC, 1942, pp. 390-91. 8. Hist. EFTC, 1942, p. 360; Hist. SAAAB, 1942, p. 210, and Jan.-Feb. 1944, PP. 38-39. 9. TC Memo 50-27-1, 12 May 1944 and 13 Apr. 1945; Hq. AFTRC, Conf. on Preflight Training, 10-11 July 1944. 10. AAF Reg. 50-14, 23 Sept. 1943; Hist. SAAAB, 1943, pp. 144-45; TC Memo 50-21-10, 9 Nov. 1944. 11. AG 201.1 (21 Jan. 1942) RB-A, 26 Jan. 1942; AC/AS, A-1 to CG AFFTC, 31 July 1942. 12. Hist. EFTC, 1942, pp. 363-64; Hist. WFTC, 1943, pp. 597-98; Hist., Randolph Fld., 1931-44, p. 235. 13. WFTC Tng. Memo 26, 24 Mar. 1943. 14. Memo for AC/S G-1 from Maj. Gen. G. E. Stratemeyer, 13 Dec. 1942; AAF to AAFFTC, 17 Jan. 1943; memo for CG AAF, 7 Jan. 1943, in Hist. of AAF Tng. Comd. and Pred. Comds., 1939-1945, pp. 400-404. 15. TWX, AFTRC to AAF, 1 Dec. 1944; Daily Diary, Hq. AAFFTC, 23 Apr. 1943. 16. Hq. AAFFTC, Flight Table "E," (rev. 23 Jan. ,943; 11 Feb. 1943); FTC Memos 50-25-1, 24 Feb. 1943, and 25 Nov. 1943; interviews, Maj. C. H. Dabezies, A-3 Div., Hq. AFTRC, 22 Jan. 1945; Col. P. C. Potter, A-3 Div., Hq. AFTRC, 25 Jan. 1945; Maj. P. M. Ferguson, A-3 Div., Hq. WFTC, 3 June 1943. 17. Hist. CFTC, 1943, pp. 1064-65; interview, Lt. T. H. Greer, Preflight School, SAAAB, 2 Feb. 1944. 18. Memo for CG AAF from Col. T. J. Dubose, 10 Jan. 1943; Dabezies interview cited in n. 16; Hist. WFTC, 1943, pp. 1057-59; TWX, AAF to AFTRC, 12 Jan. 1944; memo for C/S from Hq. AFTRC, A-3, 17 Jan. 1944. 19. Memo for C/S from Hq. AFTRC, AC/S, 24 Nov. 1943; TWX, AFTRC to 3 FTC's, 1 Jan. 1944; memo for C/S, G-3 from CG AAF, sub. : Elimination of AAFTC Prog., 30 Mar. 1944; memo for CG AAF from OC/S, 31 Mar. 1944. 20. Interviews, Maj. F. P. Dunne, A-1 Div., Hq. AFTRC, 17 Sept. 1945; Lt. Col. D. E. Ellett, OC/S Hq. AFTRC, 24 Sept. 1945, in TC Hist., pp. 429-31. 21. AFTRC to EFTC, 27 Jan. 1944; Ellett interview cited in n. 20; Hq. AFTRC, Table, Rpt. of Flying Training Students, Dec. 1944, p. 2; AAF to AFTRC, 4 Dec. 1944; Hist. CFTC, Jan.-June 1944, p. 751; Hist. WFTC, Nov.-Dec. 1944, pp. Iq6-q7; AFTRC to EFTC, 23 Sept. 194. 22. AFTRC to AAF, 17 Oct. 1944; Brig. Gen. K. P. McNaughton, C/S AFTRC to Brig. Gen. W. W. Welsh, AC/AS Training, 20 Dec. 1944; AFTRC to EFTC, 13 Mar. 1945; Dunne and Ellett interviews cited in n. 20. 23. Hist. CFTC, 1 Jan. 1939-7 Dec. 1941, I, 10-11; 111, 220-21. 24. TC Memo 50-9-1, 11 Oct. 1945; TC Hist., pp. 547-49. 25. AHS-18, Pilot Transition to Combat Aircraft, pp. 1-2, 37-39, 58-67. 26. Hist. AAF Tng. Comd., pp. 600-601, 671. 27. Hist. EFTC, 1 Jan. 1943-31 Dec. 1943, I, 276-77; Hist. WCTC, 7 Dec. 1941-31 Dec. 1942, IV, 971-72; Med. Hist., CFTC, 1940--44, p. 160; Hist. of 1st FTD, Santa Maria, Calif., 1 Mar. 1944-30 Apr. 1944, App. ; and TC Memo 50-8-2, 30 May 1944. 28. Hq. AFTCC, Progress Rpt., Dec. 1943; tables, Rpt. of Flying Training Students, Dec. 1944, Aug. 1945. 29. 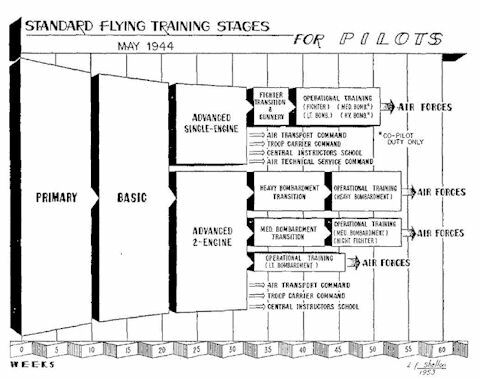 Program of Instruction: Elementary Flying Training, revisions of 6/1/19 and 5/22/40; ACID, Hemet, Calif. to WCACTC, 25 Mar. 1941; Program of Instruction: Elementary Flying Training, 15 Jan. 1943; TC Memo 50-8-1, 9 May 1944. 30. TM 1-212, Basic Flying, 20 Jan. 1942, pp. 1-2; Hearings on H.R. 4124, 25 Mar. 1941, before the Senate Subcomitee of the Committee on Appropriations, 77 Cong., 1 Sess., p. 34; R&R, Hq. AAF, Management Control Sec. to C/AS, 19 May 1944; Hist. WCACTC, 8 July 1940-7 Dec. 1941, II, 275-85; Hist. EFTC, 1 Jan. 1943-31 Dec. 1943, II, 376-79. 31. Hist. CFTC, 1939-41, III, 214-16; C/AC to GCACTC, 25 Oct. 1940; interview, Col. James H. Price, DAC/S, A-3 Div., Hq. AFTCC, 16 Nov. 1944; III Bomber Comd. to 3d AF, 8 June 1942; FTC Memo 50-9-1, 21 Apr. 1943; TC Memo 50-9-1, 8 May 1944. 32. Proceedings of a Board of Officers Convened for the Purpose of Investigating Instrument Flying and Instrument Flying Training in the AAF [late 1942]; WCAAFTC to AFFT 10 Oct. 1942; SEAAFTC to AFFTC, 30 Oct. 1942; GCACTC Tng. Memo 151, 12 Dec. 1941; Tech. Note 66-42, BuAer., Navy Dept., 21 Aug. 1942; TWX, AFTCC to WFTC, 26 Feb. 1944. 33. TC Memo 50-9-2, 1 Oct. 1943; TC Memos 50-9-1, 50-9-2, 50-9-3, 8 May 1944; Hist. CFTC, 1 Sept. 1944-31 Oct. 1944, II, 220; TC Memos O-2D, 24 Apr. 1945; 50-9-1, 20 Apr. 1945. 34. OCAC to TC's, 12 Oct. 1940. 35. AC/AC to GCACTC and SEAL TC, 7 July 1941; AFRIT to 1st, 3d, and 4th AF's and AFFTC, 1 Apr. 1942; Hist. CFTC, 1942, IV, 435; Hist. Moore Fld., 1941-44, pp. 24-26. 36. FTC Memo 50-10-1, 15 May 1943; 2d ind. (AFRIT to AFFTC, 14 June 1942), AFFTC to GCAAFTC, 15 July 1942; TC Memos 50-10-4, 1 May 1944; 50-10-4A, 19 May 1944 50-2-7, 10 Aug. 1944; Hist. EFTC, 1942, II, 465-69; Hist. WCTC, 1942, II, 347; Hist. CFTC, 1942, IV, 467-69; AFRIT to AFFTC, 2 Nov. 1942; FTC Memos 50-10-1, 21 Apr. 1943, and 50-10-8, 19 May 1943. 37. Program of Instruction, Advanced Flying Tng., Two-Engine; TC Memo 50-10-2, 19 Apr. 1944. 38. Hist. EFTC, 7 Dec. 1941-31 Dec. 1947, III, 789-94; interview, Col. W. H. Blanchard, A-3 Div., Hq. AFTRC, 5 Oct. 1943; AAF to AFFTC, 26 Aug. 1942; AAF to AFFTC, 25 Sept. 1942; AFTRC to AAF, 5 Feb. 1944; Hq. AFTRC, Progress Rpt., Jan. 1944; AFTRC to WFTC, 22 Oct. 1944; interview, Lt. Col. A. J. Perna, A-3 Div., AFTRC, 30 Apr. 1945; AFTRC to EFTC, 26 Apr. 1945. 39. Hq. AFFTC, Project Outline, 8 Sept. 1942; Daily Diary, Hq. AFFTC, A-3 Div., 2 Oct. 1942; FTC Memo 50-2-1, 14 Apr. 1943; Hist. EFTC, 1943, II, 585-96; TC Memo 50-2-3, 7 Jan. 1944; TC Memo 50-2-3, 21 Apr. 1944; AFTRC to 3 FTC's, 16 May 1944; TC Memo 50-2-3B, 27 July 1944. 40. TC Memo 50-26-12, 11 May 1944; Hist. CFTC, Sept. 1944-31 Oct. 1944, pp. 208-9; Hist., EFTC, Jan.-June 1944, I, 246, 529. 41. Hist. CFTC, 1939-41, III, 227, 390-92; Proceedings of a Board of Officers Convened for the Purpose of Investigating Instrument Flying and Instrument Flying Training in the AAF [late 1942]; FTC Memo 50-1-1, 1 Feb. 1943; Hist. CFTC, 1942, IV, 443, 492; Hist. EFTC, 1942, II, 525-26, 557-60, 596-99, 645-47, 748, 750. 42. TC Memo 50-26-12, 11 May 1944, Addendum No. 1. 43. R&R, OCAC, T&O Div. to Mil. Pers. Div., 31 July 1941; TC Memos 50-27-7, 22 July 1943, 50-27-16, 2 Oct. 1944, and 3 May 1945; FTC Memo 50-1-1, 21 Apr. 1943; TC Memo 50-27-1, 12 May 1944 and 13 Apr. 1945; interview, Maj. A. J. Perna, A-3 Div., Hq. AFTRC, 22 Dec. 1944; Hist. WCTC, 1942, II, 692-93; III, 693. 44. Hist. of EFTC, 1943, II, 398-403, 566-67. 45. Hist. CFTC, 1942, IV, 420-21; Hist. WFTC, 1 July 1944-31 Aug. 1944, I, 189, 570. 46. Air Tng. Comd., Evaluation of Individual Training in the Army Air Forces, 1946, p. 21. 47. Hist. WCTC, 7 Dec. 1941-31 Dec. 1942, III, 572; Hist. EFTC, 1 Jan.-30 June 1944, I, 297; WFTC Memo 50-9-1, 23 June 1944; Hist. WCTC, 1942, III, 577; memo for Col. W. R. Carter from Lt. Col. James H. Price, Hq. AFFTC, A-3 Div., 18 Aug. 1942; AFFTC to AAF, 27 Nov. 1942; Hist. CFTC, Jan.-June 1944, V, 827; Mar.-Apr. 1945, pp. 492-93; 1 July-31 Aug. 1945, pp. 312-13; TC Memo 50-1-3, 5 July 1945; Hist. Randolph Fld, 1931-44, pp. 229-33, 240-43, 246; FTC Memo 37-2, 19 Apr. 1943; Hist. CIS, Mar.-May 1944, p. 33. 48. Evaluation of Individual Training in the Army Air Forces, p. 19. 49. Hist. WCACTC, 1940-41, II, 229-30; Hist. WFTC, 1942, II, 308-10; Hist. EFTC, 1942, II, 463, IV, 1480-81; 1943, I, 345-47, IV, 1459-61; Hq. AFTRC, Progress Rpt., July 1944, p. 29; Hist. CFTC, Nov.-Dec. 1944, IV, 126-29. 50. Hist. WFTC, 1943, I, 239, 574-76. 51. Special War Dept. Monthly Report on Airplanes, July 1942; Hist. EFTC, 1942, III, 768, 770-72 and app., chap. XL, p. 2 1943, IV, 1465-69; Hist. WCTC, 1942, II, 369-70; 1943, II, 295-96; Hist. CFTC, 1943, II, 434-35; interview with Col. Walter S. Lee, A-4 Div., Hq. AFTRC, 6 May 1944; SEACTC to OCAC, 1 Apr. 1942; memo for AFRIT from OCAC, AFRDB, 5 July 1942; AFRIT to AFRDB, 8 July 1942; Daily Diary, Hq. AFTRC, A-3 Div., 21 July 1943; 8 Aug. 1943; Tables, Report of Flying Time of Aircraft and Personnel, Hq. AFTRC, Dec. 1944-May 1945. 52. AAF Stat. Digest, tables 46-47. 53. Ibid., tables 47-48; interview, Col. Norman L. Callish, A-3 Div., Hq. AFTRC, 16 Nov. 1944; Price interview, in Hist. AAF Tng. Comd., pp. 571-74. 54. Hist. EFTC, 1943, App., chap. IX, doc. 3, and pp. 537-38. 55. AHS-5, Individual Training of Bombardiers, pp. 1, 18-34, 42; interview, CWO T. J. Kelly, A-3 Div. AFTRC, 5 Mar. 1946; Hist. Lowry Fld., 1 Jan. 1939-7 Dec. 1941, II, 180-90, in Hist. AAF Tng. Comd., pp. 877-85. 56. R&R #1, C/AS to C/AC, 26 Sept. 1941; Daily Diary, AFRIT, 23 Sept. 1942; AFFTC, Consolidated Flying Training Report, Dec. 1942, Jan., Feb., and July 1943; memo for Col. T. J. Dubose from Maj. E. H. Herzog, 22 Dec. 1942; R&R, AFMSC to AFII-ID, 15 Oct. 1943, in AHS-5, pp. 58-88. 57. AFFTC to GCAFTC, 16 Apr. 1942; AAF to all Air Forces and AAF Comds., 28 July 1942; 2d ind. (4th AF to AAF, 3 Nov. 1942), AAFFTC to AAF, 11 Dec. 1942; AAF to AAFFTC, 15 May 1943. 58. TC Memo 50-11-1, 16 June 1943, 20 Aug. 1943, 29 Sept. 1943, 30 June 1944; interview, Maj. P. P. Dawson, A-3 Div., Hq. AFTRC, 22 Mar. 1946; FTC Memo 50-11-2, 19 Apr. 1943; Hist. WCTC, 1942, II, 447-48, 898-99, 910-15. 59. FTC Memo 50-11-2, 19 Apr. 1943; FTC Memo 50-11-1, 16 June 1943; TC Memo 50-11-1, 20 Aug. 1943, 29 Sept. 1943, 18 Feb. 1944, 30 June 1944; AHS-5, pp. 53-56. 60. TWX, AFTRC to CFTC and WFTC, 10 May 1944; AAFFTC to GCTC, 13 Jan. 1943; TC Hist., pp. 904-5. 61. TC Memo 50-11-5, 6 Aug. 1943, 2 Feb. 1944; AFTRC to CFTC and WFTC, 29 Mar. 1944. 63. TM 1-250, 7 Mar. 1941; Min. Bombardier and Navigation Conf., Hq. AFTRC, 25 Oct. 1945; Hist. Kirtland AAF, 1 July-31 Aug. 1944, pp. 216-17; interview, CWO T. J. Kelly, A-3 Div., Hq. AFTRC, 25 June 1944; AFTRC to CFTC, 1 Mar. 1944; Daily Diary, Hq. AFTRC, A-3 Div., 22 Apr. 1944. 64. Hist. Big Spring AAF, Nov.-31 Dec. 1944, pp. 87-88. 65. AFTRC to AAF, 12 Aug. 1943; FTC Memo 50-11-6, 5 July 1943; AAF FTC to AAF, 2 July 1943; AHS-5, pp. 99-110. 66. Daily Diary, Hq. RC, A-4 Div., 30 Sept. 1943; Hist. Big Spring AAF, 1 Nov.-31 Dec. 1944, p. 178. 67. Daily Diary, Hq. AFFTC, 20-21 June 1942, 13 Jan. 1943; General Yount's Project Book, Bombardier Training, 20 Aug. 1943; memo for Lt. Col. E. H. Herzog from Capt. H. O. McTague, 13 Aug. 1943. 68. Daily Diary, Hq. AAFFTC, A-4 Div., 18 Apr. 1943; TWX, AFTRC to AAF, 23 Sept. 1944; Hist. Kirtland AAF 1 July-31 Aug. 1944, p. 95. 69. Stat. Control Sec., Hq. AFTRC, Chart, Bombardier Graduates, 1946. 70. R&R, ACFTC to Asst. for Pers., Hq. AAF, 21 Feb. 1942; memo for Maj. W. S. Lee, Bombardier Sec., OCAC from Capt. E. C. Plummer, 17 Jan. 1942; Daily Diary, AFFTC, A-3 Div., 20 Oct. 1942; Daily Diary, AAFFTC, A-3 Div., 19 May 1942. 71. AFFTC to TC's, 26 May 1942; Min. Bombardier and Navigation Conf., Hq. AFTRC, 25 Oct. 1945; Chart, Bombardier Graduates, cited in n. 69. 72. AFTRC to WCTC, 16 Aug. 1943; Maj. Gen. C. L. Tinker, Hq. Hawaiian AF to C/AAF, 24 Feb. 1942; AHS-27, Individual Training of Navigators in the AAF, pp. 173-75. 75. Ibid., p. 185; FTC Memo 50-12-1, 15 Apr. 1943 and 22 July 1943; interview, 1st Lt. W. A. Bennett [rated navigator], AFSHO, 16 Jan. 1947. 76. CG AFFTC to AFRIT, 12 Jan. 1943, in AHS-27, pp. 82-83, 182-83; TC Hist., p. 820. 77. Hist. EFTC, 1 Jan. 1943-31 Dec. 1943, III, 792-97, 819; AHS-27, pp. 84, 183. 78. R&R, C/AC to C/AAF, 15 Sept. 1941; R&R, AFRDB to AFRIT, 3 Feb. 1943; Daily Diary, AFFTC, A-1 Div., 5 Oct. 1942; Daily Diary, AFTRC, A-1 Div., 23 Dec. 1943; AHS-27, pp. 135-48, 158-60. 79. Hist. WFTC, 1943, II, 486-87; AFTRC to WCTC, 21 July 1943; memo for C/Non-pilot Sec., A-3 Div. from Hq. AFTRC, Maj. J. H. Kusner, A-3 Div., 16 Nov. 1943; TC Hist., pp. 862-76. 80. AHS-27, p. 186; AAF to AFTRC, 26 Nov. 1943; AAF to AFTRC, 8 Nov. 1943; AFTRC to CFTC, 21 Nov. 1944; AFTRC to CFTC, 15 Dec. 1943; 3d ind. (AAF Nav. Intr. School (N), Selman Fld., La., to AFTRC, 24 Apr. 1944), AFTRC to CFTC, 14 May 1944; AFTRC to FTC's, 2 Aug. 1943; TC Hist., pp. 848-55. 81. Dawson interview, in TC Hist., pp. 859-60. 82. TWX, ACFTC to GCAFTC, 7 June 1942; Hist. CFTC, Mar.-Apr. 1945, I, 215; TC Hist., pp. 855-57. 83. R&R #1, AFRDB to AFRBS thru AFRIT, 9 Sept. 1942; R&R #7, AC/AS MM&D to AC/AS Training, 6 Apr. 1944; Rpt. of AAF Board, Project No. (M-4) 537, 5 May 1944; CG AFFTC to AFRIT, 26 Feb. 1943, in AHS-27, pp. 168-72. 84. Chart, Navigator Graduates, in TC Hist., p. 846. 85. Psych. Sec., Office of the Surgeon, Hq. AFTRC, Table VI, September 1944 Test Battery; Dawson interview cited in n. 81; interview, Capt. A. R. Kooker, Hist. Off., Hq. AFTRC, 17 Oct. 1944. 86. TC Memo 50-12-1, 22 Nov. 1943, in AHS-27, pp. 84-85; Chart, Navigator Graduates, in TC Hist., p. 846. 87. Lt. Gen. H. H. Arnold and Col. I.C. Eaker, Winged Warfare, p. 45; Gen. H. H. Arnold to AAFFTC, 29 June 1943; TC Hist., pp. 978, 1018. 88. R&R, OCAC, Maj. Lee to C/Tng. Div., Nov. 1941; Table, Flexible Gunnery Training Schools, in TC Hist., pp. 981-83. 89. Memo for General Perrin from Brig. Gen. R. W. Harper, 3 Sept. 1943; C/AS to CG's all AF's, Comds., etc., 1 Dec. 1942; Brig. Gen. R. W. Harper to CG AFFTC, 27 Apr. 1943; Brig. Gen. R. W. Harper to CG AFTRC, 3 Aug. 1943, in AHS-31, Flexible Gunnery Training in the AAF, pp. 13-16. 90. Chart, Flexible Gunnery Graduates, in TC Hist., p. 985; AAF Stat. Digest, tables 47, 50; Hq. AFTRC, Project Book; TWX, GCAFTC to AFFTC, 18 Apr. 1942; AAF Reg. 35-17, 10 Feb. 1943, in TC Hist., pp. 984-89. 91. TWX, AFTRC to EFTC, 26 Oct. 1943; Gunner's Information File (AAF Manual 20), rev. Feb. 1945, in Hist. EFTC, 1 Mar. 1945-30 Apr. 1945, I, 372, 1047-49; AHS-31, pp. 100-101. 92. Hist. EFTC, 1942, III, 983-84; 1943, III, 871-72; Rpt. of Conf. on Flexible Gunnery, 6 June 1942; Col. L. W. McIntosh, Rpt. of Training Inspection of AFTRC Flexible Gunnery Schools, 11 Aug. 1943, in TC Hisc., pp. 999-1000. 93. Hist. Kingman AAF, 1943, p. 48; Hist. EFTC, 1942, III, 962, 965-66, 986-89; 1943, III, 880-83; Col. L. W. McIntosh, Rpt. of Tng. Inspection of AFTRC Flexible Gunnery Schools, 11 Aug. 1943. 94. 94. AAF to AFTRC, 31 Aug. 1944; Hist. of EFTC, Nov.-Dec. 1944, I, 389; Hist. WFTC, Mar.-Apr. 1945, II, 254-55; May-June 1945, I, 138-39, 1054-55; AHS-31, pp. 63-71. 95. AFTRC to AAF, 1 Dec. 1943; AAF to AFTRC, 4 Dec. 1943; AFTRC to EFTC and WFTC, 30 Aug. 1944; memo for Gen. H. H. Arnold from Hq. AFTRC, 12 Dec. 1944; interview with Lt. H. D. Shearn, Frangible Bullet Off., Laredo AAF, 29 Oct. 1945; Daily Diary, Hq. AFTRC, A-4 Div., 4 Aug. 1945, 5 Aug. 1945, in TC Hist., pp. 1056-58. 96. Hist. EFTC, 1942, III, 953-55; 1943, III, 863, 892-93, 903; AFRIT to AAFFTC, 15 Feb. 1943; memo for Col. Harding from Maj. R. F. Worden, Hq. AAFFTC, 17 Oct. 1942; FTC Memo 50-13-3, ,7 Feb. 1943; TC Memos 50-13-1A, 31 Aug. 1943; 50-13-2, 19 Aug. 1944; Hist. Laredo AAF, Jan.-Feb. 1945, III, 99-100; interview, Capt. A. H. Payne, Jr., CSFG, 30 Oct. 1945. 97. TWX, AAF to AFTRC, 6 Mar. 1944; Hist. Buckingham AAF, , Nov.-31 Dec. 1944, II, 17-20; 1 Mar.-30 Apr. 1945, II, 58-74, 107; memo, Hq. AFTRC, Rpt. of Conf., 9 Oct. 1944; Daily Diary, Hq. AFTRC, OD/FG, 25 Apr. 1945, Hq. AFTRC, A-1 Div., 28 July 1945; AFTRC to EFTC, 22 May 1945. 98. AAFFTC to AAF, 23 Feb. 1943. 99. Sheppard Fld., Texas, to AAFTTC, 12 May 1943; AAF to AFTRC, 9 Oct. 1943; AAF to AFTRC, 9 Mar. 1944; AFTRC to AAF, 13 Apr. 1944; AFTRC to AAF, 7 Feb. 1945; Stat. Control Sec., Hq. AFTRC, Special Rpt., 18 Jan. 1945. 100. Hist. Amarillo AAF, May-June 1945, III, 101-2; TC Memo 50-32-8, 7 July 1944; Course Outline for B-29 Flight Engineer Course, Lowry Fld., Colo., 1 Nov. 1944. 101. WTTC to AFTRC, 8 Feb. 1944; Lowry Fld., Colo., to WTTC, 26 Aug. 1944. 102. Hist. Boca Raton AAF, 1 May-30 June 1944, App. B, Item 12; AFTRC to ETTC, 16 Sept. 1944; AFTRC to WFTC, 20 Sept. 1944; AFTRC to AAF, Dec. 1944; AFTRC to WFTC, 22 Dec. 1944; AAF Stat. Digest, table 50. 103. Hist. Boca Raton AAF, 7 July 1943-1 Mar. 1944, app. B, Items 8-10; Radar Standardization Bd., Chart, AAF Radar Tng., in Monograph on Communications Training, 1 Jan. 1939 to 31 Dec. 1944 (rev. ), pp. 46-63.